I’m aware of the alarmist tone of this post but it is truthfully a serious conversation about something that’s so easily preventable. As the Senior Editor here at EARMILK, I've issued a full mandatory requirement for any of our writers to wear earplugs when attending/reviewing any concert or festival on our behalf. Over 700 million people around the world suffer from some form of Tinnitus or ringing in the ears. This recent flood of self-induced hearing damage from oversized studio headphones, grandiose speaker systems, and silly notions carried over from ill-advised past generations – equating decibel levels to enjoyment – have created a music industry epidemic. When it happens, it just happens. You'll leave the vibrating walls of an after hours show, that divey rock n’ roll nightclub or even maxing the sub in your car to peep Slime Season 3 and suddenly, you're hit with a ringing in your ear that never seems to really go away. In 2011, a fan left a concert for Them Crooked Vultures, comprised of Foo Fighters' Dave Grohl, Led Zeppelin's John Paul Jones, and Queens of the Stone Age's Josh Homme, with an inescapable ringing in his ears. This relentless ringing never left and weeks later eventually led to the fan stabbing himself to death as an, ".. accepted death as a side-effect of stopping the noise," claimed his psychiatrist Dr. Helen Stinson (International Business Times). EARMILK had the chance to speak with, owner and founder of Sound Relief Hearing Center, Dr. Julie Prutsman, who’s a tinnitus specialist at the forefront of her field. "Everyone has left a show at some point and has felt that headache or temporary ringing that eventually goes away. Each time that happens, it's actually a warning sign from the brain letting you know that the body is close or approaching permanent damage to the ear.” said Prutsman. “This damage is irreversible, we have no way of regenerating it and once it’s gone, it’s gone." For every time you've claimed, "It's alright, the ringing eventually goes away," and popped an Aspirin after a show, you've become one step closer to irreversible damage. Think of it as 9 lives of a cat scenario and you can bet it's not going to be fun when you’re last life is used up. Now, try taking calls at work, have a casual brunch with an old friend or even crack into that Haruki Murakami novel that seems to be the hip new read. There will always be that incessant jingle of white noise haunting everything you do. Sounds like it would drive you crazy, right? Well, it actually does. It is not uncommon for tinnitus victims to suffer immeasurable declines in mental health. An estimated 50 million Americans have tinnitus in at least one ear, and 2 million of those have a case so severe that it inhibits their ability to complete simple everyday activities. (Healthy Hearing). In 2011, of the 9,000 patients who have come to the tinnitus clinic at Oregon Health & Science University in Portland, Clinic Director Billy Martin said he was aware of eight who had committed suicide (ABCNews). The ringing in their ears became so unbearable, that death was the only sought after relief. Many cases of suicidal thoughts while suffering tinnitus have also been correlated to increase previous mental health conditions of depression and are expedited once the ringing begins (Medical Daily/PBS). And fans are not the only ones vulnerable. Many famous musicians such as will.i.am, Phil Collins, Ozzy Osbourne and more suffer from this daily. Given that a musician's livelihood rests in their ability to hear, it should go without saying—no hearing, no music. So what measures are being put in place to prevent further damage to our ears? "Putting tissue in your ear is not going to cut it. Sound waves can still pass through them and damage your ears," Dr. Prutsman jokes mildly. So don't do that. Today, we many US-based companies are leveraging new technologies to assist in both protecting our hearing with function and style. EARMILK spoke with Noah Kraft, CEO and Cofounder of Doppler Labs. His company is using new advances in audio technology to enhance users overall audio sensory experience. This is an exciting new sector, as the product development of audio devices have always been geared towards the hearing impaired and not so much the fan experience beyond just the typical headphone manufacturers. Doppler Labs partnered with Coachella in 2015 to provide a free pair of their DUBS Acoustic Ear Filters in the box of every ticket holder that attended that year. Anyone who’s ever told you that you would look weird for wearing ear plugs is a moron. The new technology being offered today makes protecting your ears incredibly comfortable and minimal in its visual aesthetics compared to years past. Like all things health, every professional in the field stands behind the notion that ear care is all about taking preventative measures. Skeptics often argue that enhanced hearing technology distorts the pureness of live sound. These, of course, are the leftover ill-advisement from previous generations that are now dealing with the negative results from blasting those Whitesnake records in their basements. 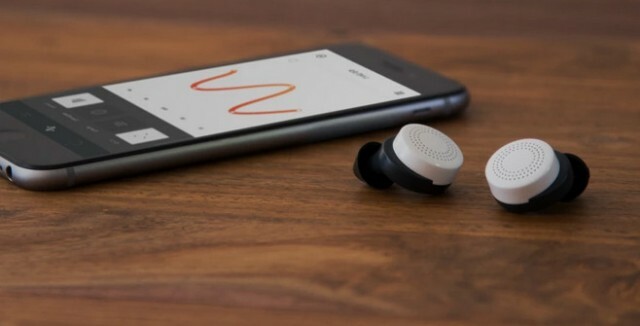 Doppler Labs’ new Here Active Listening earbud technology, will allow users to tweak certain sonic qualities, including bass, reverb, echo and volume, to name a few. It's all done through bluetooth connected earbuds from your phone. This year, Coachella attendees will have the chance to try Here demos at various locations of the venue if you follow their Twitter page: @hereplusme. So if you’re venturing to Indio keep your eyes peeled. Look, we all like loud music. EARMILK and other music sites wouldn't exist if no one enjoyed listening to it so much. So for our sake and yours, continue to keep reaching for those earplugs before heading to a show. And if you truly care about your friends, you'll make sure they do too. *The company DanceSafe is a tent found within various electronic events that promote a healthy experience and are known to assist attendees in freely testing MDMA to ensure that they received the proper substance that they intended. They also offer a giant bin of earplugs for those who may have forgotten to bring any, so keep an eye out for them as well.